Guy is a partner and head of our Litigation, Insolvency & Restructuring Group. He joined Campbells in 2005, having previously practised in London with a leading international firm. In his spare time Guy is a keen adventurer. He has climbed the Seven Summits (the highest mountain on each continent), skied to the South Pole and cycled across the United States. Guy has acted for creditors, shareholders, provisional and official liquidators, directors, managers and other professional service providers in relation to the restructuring and liquidation of numerous Cayman Islands companies and other entities. Guy also has a busy general litigation practice involving widely varying commercial contexts and structures, but with a particular emphasis on shareholder and investment fund disputes. 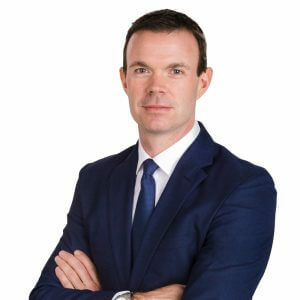 He has been involved in most of the jurisdiction’s highest profile disputes, liquidations and restructurings over the last decade. advising LDK Solar CO., Ltd and its provisional liquidators in connection with the cross border restructuring of USD$700 million of offshore debt across the LDK group. Guy is ranked by all the major legal directories. He has given expert evidence of Cayman Islands law to various foreign courts and is a regular speaker at international insolvency and fund conferences. Chambers and Partners report that Guy is “a formidable opponent and smart man” and “his knowledge of Cayman insolvency law and restructuring matters is excellent and he really knows his way around those cases” (2018), “a very bright man who gives useful, fit-for-purpose advice that’s commercially focused,” is widely regarded as “one of the nicest, most personable people in Cayman – a delight to deal with” (2017), “thinks carefully about the case and offers practical, commercial advice to help us get the best outcome” (2016), is “a very considered and technical lawyer; he accommodates innovative thinking and applies the law commercially” (2015), and is “a stupendously clever man… who has quickly established an impressive reputation in the Cayman Islands” (2014). 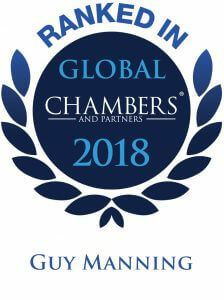 The International Who’s Who Legal names Guy as a leading Insolvency & Restructuring and Asset Recovery lawyer in Cayman. Guy is also ranked as a Leading Individual Dispute Resolution Lawyer by Legal 500.